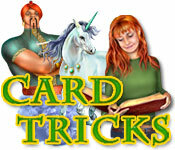 Card Tricks is rated 3.4 out of 5 by 5. Rated 5 out of 5 by arnold1049 from MATCH TWO GAME I played less than half the free demo and enjoyed the game so much that I knew it was a buy for me. I made it to the last location of the first level of Magic. I played the Action level of difficulty where you play against a timer. The Relaxed mode can be played without a time constraint. Magic Level One is a matching card game where matching two cards with the same number uncover more cards to be matched. Cards appear in groups with some cards revealed and others that will be revealed once the card on top is matched and removed. These groups slowly move across the screen from right to left. 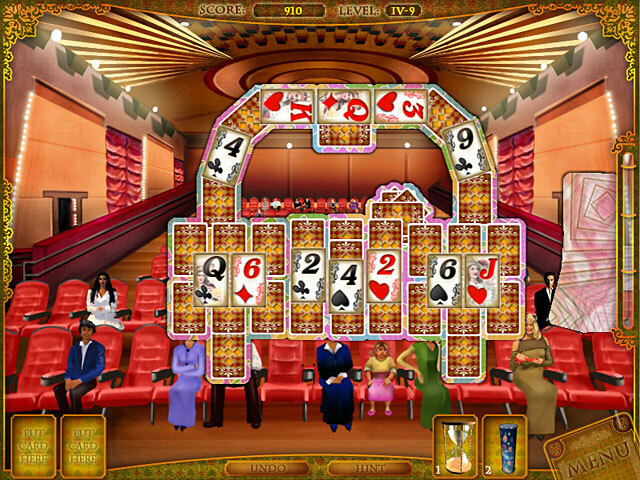 All cards must be matched in each group before that group reaches the left side of the screen. There are "power ups" available, like a fire cracker that removes several cards at once, or a sand timer which stops the movement of the groups across the screen to give you more time to find matches. Cards can be matched between/among all the groups on the screen. Up to two cards can be taken off the boards and set aside to be matched later. This frees up the cards under the card that is moved to the holding place. As each group of cards is completed, balloons are released that you must click on to pop before they reach the top of the screen. Popping the balloons add to your power ups and generates points for your score for each location within a level. However, while you are busy popping balloons, the groups continue their movement across the screen. If a group makes it to the left side of the screen before all the cards in that group are matched, the location is over. You can replay the location or go onto the next one. 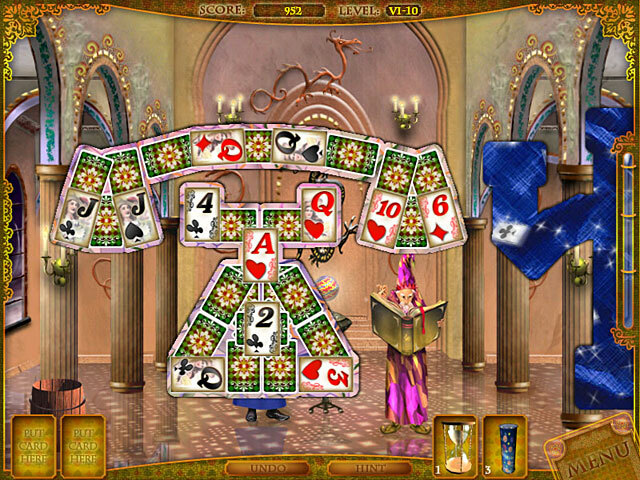 Each location within the Magic level increases in difficulty; more cards to match in each group, more groups, more balloons, and groups and balloons moving faster across the screen. I am not a fast clicker, but I was able to keep up with the pace of the game, at least within Magic Level I. I did miss a balloon here and there, and a couple of times, a group got to the edge of the screen before I could match all the cards, so I had to replay it. This was a good pace to match my skills. As I move into the next level, Magic Level II, etc., this may change and I may have to replay more often, or change to Relaxed mode to avoid the frustration. But that's what's neat about this game; lots of options and lots of different things to play. Rated 4 out of 5 by redfish3 from fun and different I like the game. I started out on the relaxed mode and later decided to try the action mode. I want to go back to the relaxed mode but can't find a way to do it. Rated 4 out of 5 by AnimalFriend46 from Wow! So fun! This is a really fun game to just do during some relaxing free time... but man does my hand hurt. I have been clicking over the last hour and my hand really does need a break but it is so worth it. I like to see how fast I can make matches! I like it because it's playing with cards but isn't the normal card games you find. I didn't loooove it though so that is the reason for four and not five stars. Rated 3 out of 5 by Lilac13 from Good for kids! 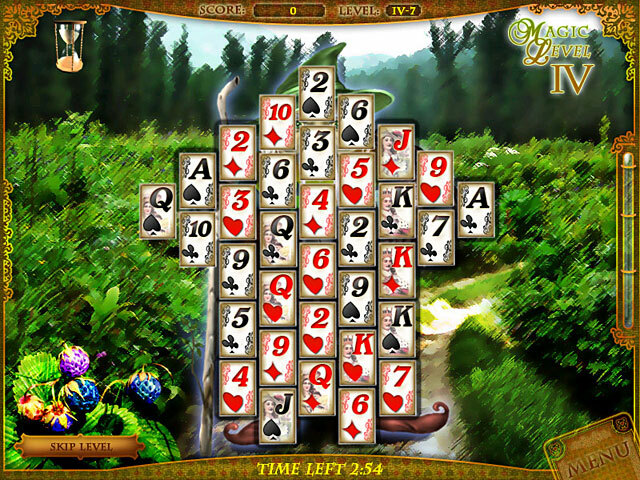 I was looking for a new Solitaire game to play, thought I'd try this since it hadn't been rated. It's a good children's game for them to learn to play solitaire. Has relaxed and timed modes, has records to beat, etc. Rated 1 out of 5 by BayouWoman from It scrolls As you make matches each puzzle layout (why cards and not mahjong tiles?) scrolls across the screen, if it hits the left side before you have finished you lose. This means you have to be watching and matcing cards as they are scrolling. I HATE scrolling things, they are hard on my eyes and give me a headache. If you finish a layout it releases balloons that are then going UP the screen for you to pop, now you have things scrolling across as well as up and down, I HATE scrolling things, it messes with my eyes and gives me a headache. For me the constant movement totally ruins any "fun factor" this game may have had. I like to play these types of games to relax, not to get nauseous. A total zero for me, not recommended at all.